The Elwood City gang is back, with four brand-new Arthur episodes premiering the week of Valentine’s Day, February 12-15, 2018. 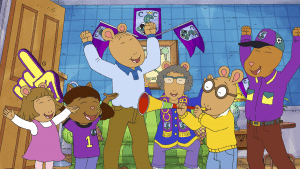 Kids can tune in to CPTV Kids to see D.W. uncover the true qualities of a princess; watch Arthur stand up for a friend; and cheer alongside the whole gang for a big soccer match. Even Arthur’s dog Pal gets in on the fun! Airing February 12 at 5:30 p.m.
Muffy worries that her friends don’t need her anymore when they plan a successful bake sale without her. Then, Arthur thinks Mrs. MacGrady is being treated unfairly, so he decides the best way to take a stand is to take a seat. This episode features a special cameo appearance by civil rights legend Rep. John Lewis. Airing February 13 at 5:30 p.m. When Rattles takes over Slink’s paper route, Slink is determined to prove himself and earn his job back. Then, when the Tough Customers go on a hike in the woods, Molly makes a few mistakes and has to apologize… but she refuses to! Airing February 14 at 5:30 p.m.
It’s pretty hard to lose a dinosaur, but Rapty is missing! Can Bud be brave without his imaginary friend? Then, D.W. loves the Princess Platoon series… until she realizes that it doesn’t represent everyone. With the help of Arthur’s friend Lydia, D.W. discovers the true qualities of a princess. Airing February 15 at 5:30 p.m.
Kate appears to be hypnotized by the soccer game on the television! Can Pal, Amigo, and Killer snap her out of her TV trance? 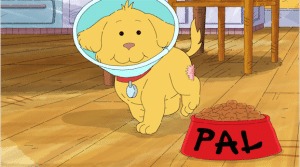 Then, when Pal has to wear a cone, he takes advantage of his friends’ special treatment… and the decision comes back to bite him!